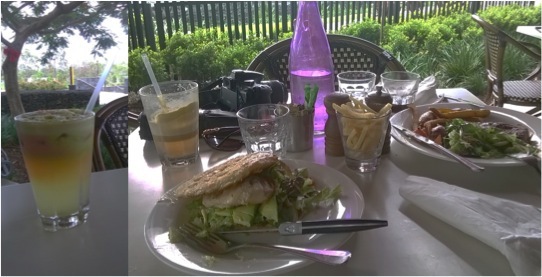 In Tennyson lies Buzz Bistro,, a lovely little restaurant with a wonderful view of the Brisbane River. We arrived at 11:30 assuming that getting a table would be easy, however, the waiter had to search through his very full reservation book to ensure there was actually a space for us. With a little shuffling he was able to accommodate us, for which we were very grateful. This would suggest that if you intend on enjoying a lovely lunch too you would need to book ahead. If it is that busy on a Tuesday, make sure you book well in advance for weekends. We settled down at a table facing the river in between a mother's group and some businessmen deep in discussion. Obviously this restaurant caters to everybody's food needs. In the midst of a health cleans I ordered a Tickled Pink juice and was blown away by the mix of delicious flavors; strawberry, apple, watermelon and mint are the perfect combination. I would certainly recommend it to those wanting to curb their soft drink habits. Usually I'm a Coke drinker but with those delicious flavours running down my throat I did not once want to lean over and take a sip of my partner's fizzy drink. The food arrived rather quickly and I enjoyed a grilled chicken burger with a glass of fries… yes, that is right, I did say a glass of fries! The burger was on a toasted Turkish roll and I gobbled up as much as my tiny tummy could handle. I even tried to push beyond what my stomach could hold because I enjoyed it so much. My partner ordered a Sirloin steak, which was cooked to perfection. He is not a massive talker but assured me it was delicious. We chatted for an hour, taking in the view, and after we finished our meal we enjoyed a stroll along the river. Sometimes I find a meal simply isn't enough to lure me out of my pyjamas, but chuck in a nice walk and fresh air and I will be dressed before the car engine starts. This combination of Buzz Bistro and a wonderful walk will definitely get me motivated again next weekend. If Tennyson is too far away then luckily there is a Buzz Bistro in Fortitude Valley, Newstead and Rocklea. Nice opportunity to walk off the meal along the river, beautiful!